You could have been forgiven to think that you had stumbled into a Summer Concert on this balmy April evening when we were treated to a sparking array of music from the Big Screen. 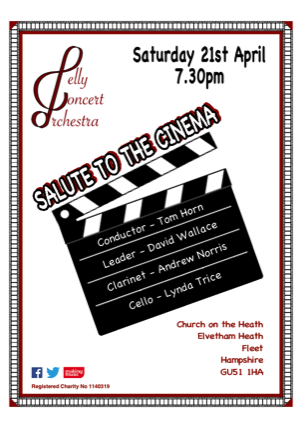 Original music from Salute to the Cinema medley, Cinema Paradiso, themes from Westerns and The Lion King to the perennial favourite Lord of the Rings was combined with ‘classical’ repertoire which has been used to great effect in film. The string section showed great sensitivity in their playing of Intermezzo from Cavalleria Rusticana (from the Godfather Part III) and excerpts from The Lion King - beautiful! To add to this. we were treated to superb soloists as well - Lynda Trice on cello playing The Swan from Saint-Saens’ Carnival of the Animals (Flowers in the Attic) and Andrew Norris on clarinet with Adagio from Mozart’s Clarinet Concerto (Out of Africa/The King’s Speech). 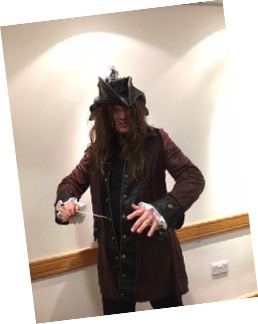 It was fantastic to have so many come to join Pirate Tom (our conductor) on a journey through an array of music including Pirates of the Caribbean, Bob the Builder, Carnival of the Animals, Beauty and the Beast and Star Wars. The children took the opportunity to get close to the orchestra while they were playing to hear and see what was going on. There was also opportunity to sing in a round, with different sections of the orchestra. It was a great informal concert immensely enjoyed by audience and orchestra alike. See what some of our audience said here. Our Christmas concert had a Pantomime theme - taking music from many well known and loved fables and stories - Cinderella, Beauty and the Beast, Snow White and the seven Dwarfs, The Three Bears and Sleeping Beauty alongside festive favourites. It was lovely to welcome William Godfree back for this concert. He last joined us eleven years ago to narrate his setting of Roald Dahl’s version of Aladdin and his Magic Lamp. It certainly had not lost any of it’s magic or humour as we were treated to a fantastical adventure of a greedy Scotsman who tricked Aladdin into retrieving the magic lamp from a cave only to have the tables turned on him. 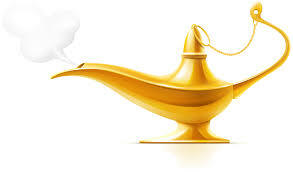 When Aladdin found the lamp, and thus the genie, his wish was that he too became a genie. The story goes that this happened over 500 years ago and that Aladdin is still around, helping to create geniuses - among them Shakespeare and Mozart! Who knows who he will help next!? A huge THANK YOU to Waitrose, Frimley and all our supporters as we have received a cheque for £246 from the Community Matters scheme. Part of this sum has been allocated for the purchase of music - a selection from Beauty and the Beast by Alan Menken which we will play in our ‘Pelly Goes to the Panto’ concert in December and our ‘Children’s Concert’ in February 2018. 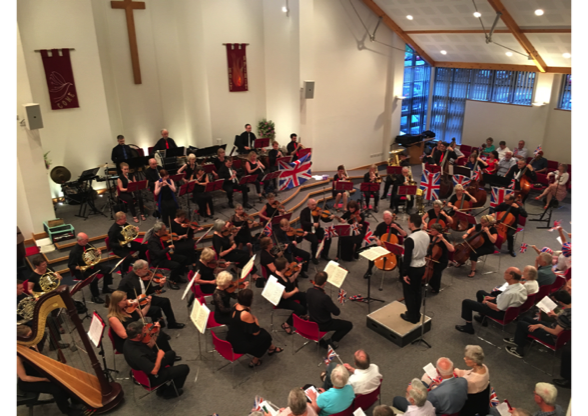 Pelly Concert Orchestra has been selected as one of the ‘Community Matters’ nominated charities during the month of September in Waitrose, Frimley. Each of the nominated charities will get a proportion of £1000, the actual amount depending on how votes each gets. Every time you shop in Waitrose, Frimley, please make sure you get your little green token and vote for PELLY CONCERT ORCHESTRA. It doesn’t matter how much you spend, you can still get a token. 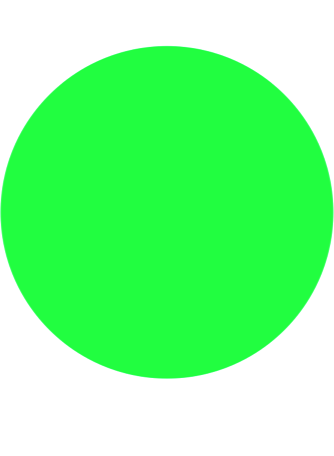 Remember to get your token! Our 50th Birthday celebrations were full of fizz and fun! The wonderful Elisabeth Meister added sentiment with her poignant rendition of Puccini’s O Mio Babbino Caro and sophistication with Gershwin’s Summertime. 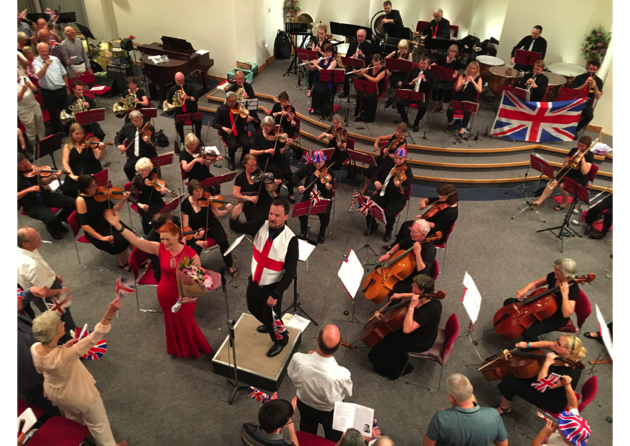 Rule Britannia (the conclusion of Henry Wood’s Fantasia on British Sea Songs} sparkled and the audience were brought to their feet as she joined with them for Parry’s Jerusalem. 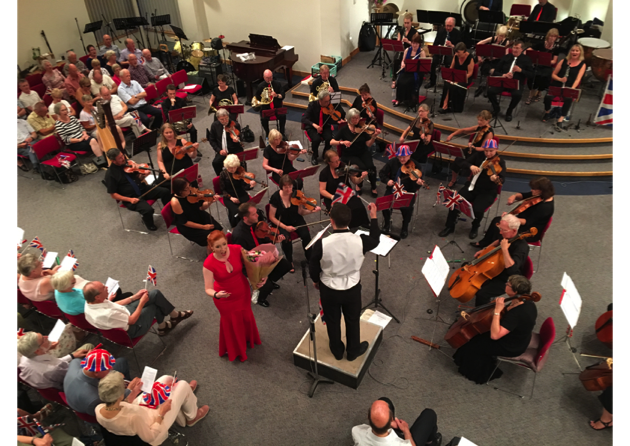 Throughout the concert, the audience was taken on a journey with music from around the British Isles. From the Merry Wives of Windsor, to the Jubilee Dances by Welsh composer William Mathias, a Lament for Strings by Aloys Fleishmann, concluding the first half with Malcolm Arnold’s quirky Four Scottish Dances. An air of frivolity pervaded in the second half, with Mancini’s Pennywhistle Jig and Variations on Happy Birthday arranged by Peter Lawson. The famous ditty was cleverly interwoven within an array of musical styles including a Bavarian Cuckoo Clock, a Latin-American Salsa, Beethoven’s 5th Symphony and Waltzing Matilda! Rehearsals are well under way for our celebratory Prom Concert on 8th July. We have some great music lined up as well as some surprises. We are delighted to announce that the Internationally acclaimed soprano Elisabeth Meister will be joining us for our festivities. You can find out more about her here. Tickets are already being snapped up for the forth-coming concert. Be sure to get yours in plenty of time! Don’t forget our Quiz Night on 26th May - details below. Gershwin’s toe tapping Cuban Overture, a sultry rendition of Summertime and a breathtaking performance Rhapsody in Blue formed part of a thoroughly enjoyable jazz-inspired concert on 25th March. Having Can Arisoy as our piano soloist was our first collaboration with the Yehudi Menuhin School. 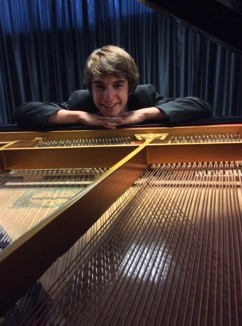 This accomplished, confident and charming young man brought the notes alive with sparkling dexterity, wowing a sell-out audience with his virtuosity to conclude the first half of this evening’s concert. Leroy Anderson was there with his Syncopated Clock and Blue Tango alongside rip-roaring Medleys from 1920s, Chicago and Porgy and Bess with Henry Mancini’s music, Mancini Magic wrapping up proceedings. Want to guarantee a front row seat for our next concert on 8th July? Support us by becoming a Patron, details here! We have a Quiz Night planned for Friday 26th May. It will be hosted by Quiz Masters Rolly and Lynda Trice. Maximum 6 people in a team, £5 per team member. Some nibbles will be supplies but please bring your own snacks, drinks and glasses. We presented our New Year Concert on Saturday 21st January to a packed concert hall. The party got started with Strauss’ Overture to Die Fladermaus and things were definitely warmed up by the time the Skaters emerged for Waldeufel’s Waltz which was much in keeping with the freezing temperatures outside. The audience took little encouragement to join in, in traditional style with another Strauss favourite, his Radetzsky March. The first half concluded with a visit to Spain with Bizet’s Carmen Suite No.2. The party atmosphere resumed after the interval with Strauss’ Tritsch Tratsch Polka, followed by a beautiful rendition of the Fantasy from Ladies in Lavender, played by David Wallace. From the sublime to … Tchaikovsky meets the Beatles - The Beatlecracker Suite. A slightly surreal but very clever and quirky combination of The Nutcracker and songs from the Fab Four! Carnival in Paris - a delightful offering by the Norwegian composer Svendsen - brought the evening to a suitable climax of gaiety, raucousness and frivolity before the evening concluded with the effervescent Thunder and Lightning Polka by Strauss. Both audience and orchestra left with the feeling that the New Year had definitely been heralded in an appropriate manner. On Saturday 17th December, we presented a concert of Christmas favourites including Sleigh Ride, Christmas Festival, Rudolf the Red-nosed Reindeer, Walking in the Air and traditional carols. The concert was recorded and we asked if Frimley Park Hospital would like to play it on their radio station during the Christmas period. We were delighted to learn that it was aired at the prime time of 2pm on Christmas Day! We hope that it helped to raise the spirits of some of those in hospital during the Festive Season. We also hope to be able to continue our share music making in this way in the future. ‘Musical Allsorts’ Concert a great success! Saturday 13th August finally arrived. 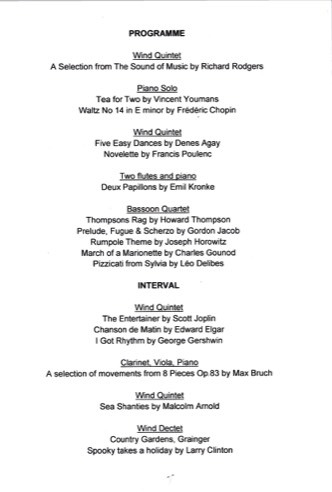 The concert was a bit of a departure from our usual orchestra format as we had put together two wind quintets, a flute duo, viola and clarinet duo, piano solo, bassoon quartet, concluding with a wind dectet. It was a beautiful balmy summer evening with an enthusiastic and appreciative audience as we performed a wide variety of musical styles from a Sound of Music Medley to Pieces for clarinet and viola by Max Bruch. Our quartet of bassoons proved to be a real treat, playing Thompsons Rag and Funeral March of a Marionette by Gounod within their programme. This, mixed with The Entertainer, Sea Shanties, Tea for Two on piano (alla Mike Thomson) and much more besides provided a most enjoyable evening for all concerned. 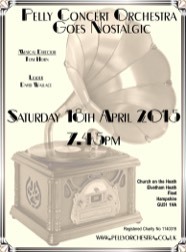 We have been invited to help celebrate the 175th anniversary of Christ Church, Crookham. 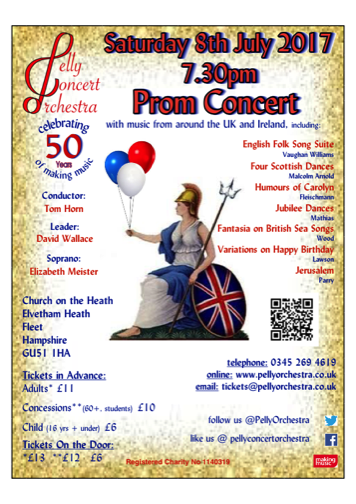 The orchestra played at their 150th celebrations and this time we will be providing a concert of chamber music performed by members of the orchestra. It promises to be a fun and interesting programme. Please come along and join us. Come and join us for our final orchestral concert of the season on Saturday 18th June. It will be a musical feast - Picnic with the Pelly! We would like to congratulate Michael McConnell (2nd violin) and his wife Jasmine on the birth of their baby boy William on 24th April. Our concert on 16th April was truly ‘Out of this World’. Our programme ranged from Superman and Batman vying for supremacy to encounters with Dr Who, E.T. and characters from Star Wars. There were lunar references with Debussy’s Clair de Lune and a particularly poignant moment featuring our solo trumpeter Chris Preddy and his rendition of the theme from Apollo 13. Throughout, our Musical Director Tom Horn kept our audience enthralled with his enthusiastic and knowledgeable insights into the music being played. 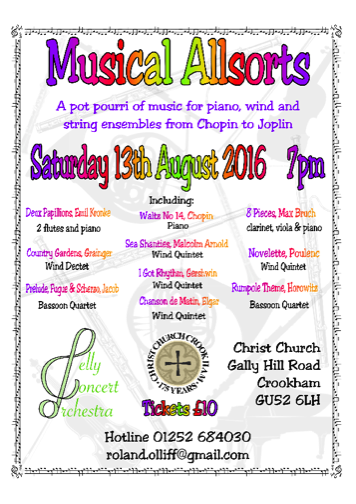 Come to our next concert and have a Picnic with the Pelly on 18th June - a veritable musical feast! Karen Carter has now officially taken over as Chair of the orchestra. Barbara wishes to thank everyone for their help and support throughout her time as Chair but due to increased teaching commitments has had to step down. She continues as Vice-chair and Librarian. Rehearsals have begun for our concert on 24th October concert. We currently have a few vacancies for new players, you are most welcome to come and meet us on a Tuesday evening. 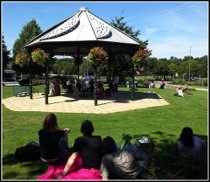 Our String Quartet and Wind Quintet spent a most enjoyable lunchtime on 22nd August serenading our audience in the sunshine at the bandstand, Princes Gardens, Aldershot. Thanks to all who came to support us. The orchestra has been invited to play in the bandstand in Princes Gardens Aldershot. Unfortunately due to the holiday season, many of our members are unavailable. But we have a Pelly Orchestra String Quartet and Wind Quintet who will be serenading the audience in the gardens between 12 - 2pm on Saturday 22nd August. Please come along and support us. It’s free! 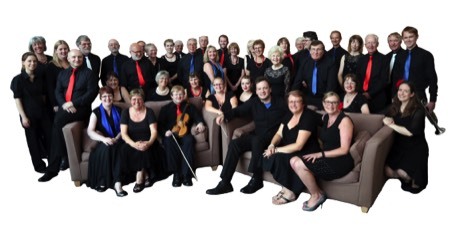 Our concert on 11th July has been hailed a great success. Our VE day inspired programme (see our archive page) drew a large audience and was a fitting end to the season. We are delighted to announce that the retiring collection raised £196.54 towards Help for Heroes. The orchestra had some photographs taken before and during the concert and you can now ‘Meet the Orchestra’. We hope to see you at our next concert on 24th October. We were delighted to welcome our newly appointed Musical Director Tom Horn to preside over our concerts on 18th April. Our first concert of the day featured a programme to entertain the younger generation. 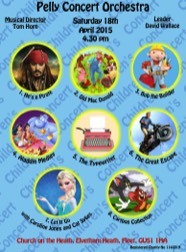 This included Let It Go, from Frozen, He’s a Pirate from Pirates of the Caribbean, a rendition of Bob the Builder (arranged and orchestrated by one of our trumpet players, Tim Stoney), Leroy Anderson’s Typewriter*, with a ‘typist' from the percussion section and cartoon capers with a collection from favourite cartoons. * If your typewriter keys are 'a little slow’ WD40 works wonders for adding that extra zip! Nostalgia was in abundance throughout the evening as we indulged in music from yesteryear. Television and radio themes included The Onedin Line, Inspector Morse and Dr Finlay’s Casebook which sat along side music from film and shows, including Cats, Grease and Robin Hood. The audience was treated as an encore, to Leroy Anderson’s energetic and quirky arrangement of Old MacDonald. The Pelly Orchestra is delighted to introduce Guest Conductors for each of the first two concerts of our 2014/15 Season. On 25th October, Lindsay Ryan will be casting her spell over a concert of musical Fairy Tales, both traditional and new. The concert will have music from Sleeping Beauty (Tchaikovsky), Hansel and Gretel (Humperdinck), Harry Potter (Williams), Snow White (Churchill), Aladdin (Neilsen) and Disney (arr, Dodge). On 24th January, Tom Horn will present A Pelly Portrait of England, a wonderful collection of music with English connections. The programme will include Banks of Green Willow (Butterworth), Soirées Musicales (Britten), Walk to the Paradise Garden (Delius) and themes from television and radio – The Archers, Thunderbirds, Blackadder and Desert Island Discs! Both concerts will be in Church on the Heath, Fleet and will start at 7.45pm. This, our final concert of the 2013/14 season, saw us embark on the last part of our journey with Christopher Braime as conductor. It has been a privilege for us as an orchestra to have been involved in the early stages of Chris’ conducting career, and to have seen both him and the orchestra flourish since his appointment as Musical Director in 2007. 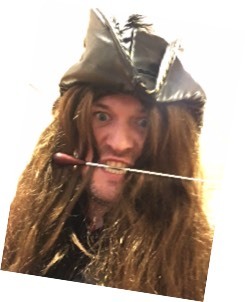 Throughout his time with us, Chris has led us all through an amazingly wide array of musical experiences, combining familiar music with works not previously explored by the Pelly. He has introduced us to wonderful and inspiring soloists and leaders and supported and guided the orchestra over the years, raising the bar of expectation of both players and audience. Of course, throughout, he has always exhibited his incorrigible sense of optimism and fun. We wish him well for the future.